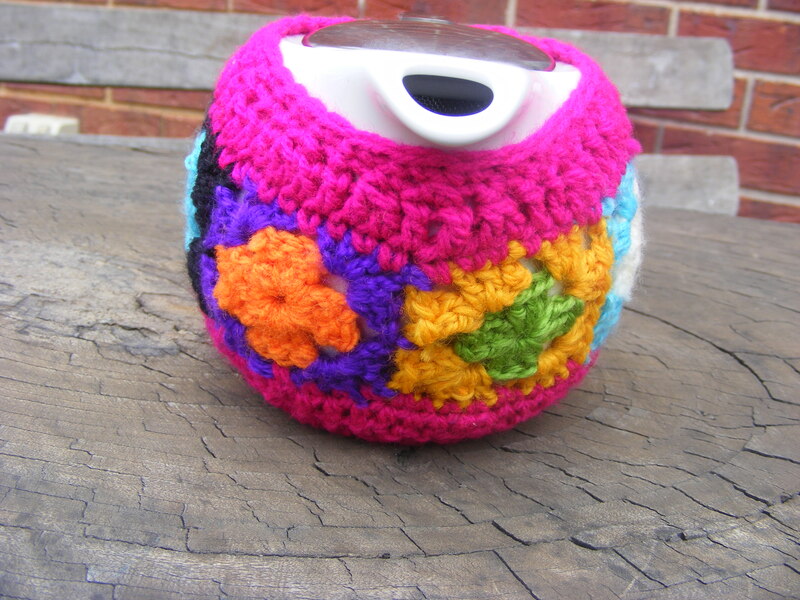 This tea cosy pattern is designed for those sleek looking teapots that don’t really have much of a spout, but pour out of the top. 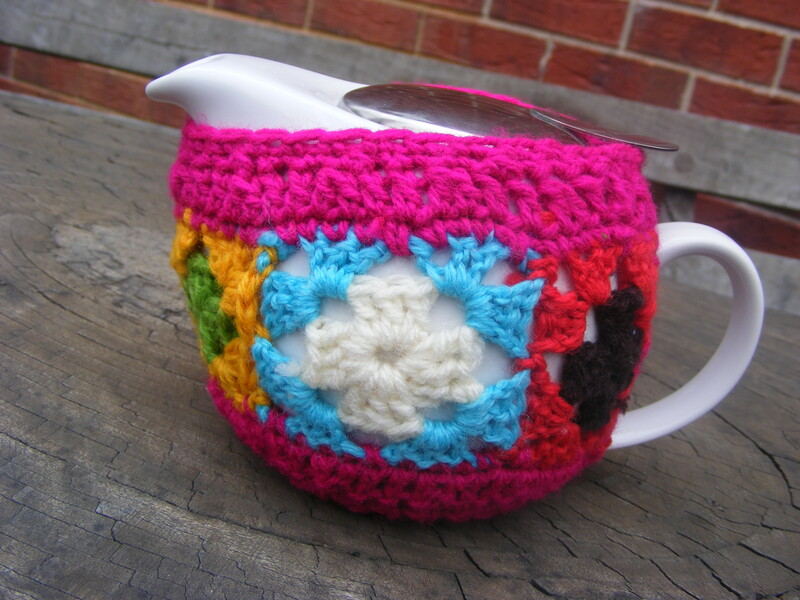 I’m sure the pattern could be modified to suit other types of teapot, but for now, we’ll stick to this kind. 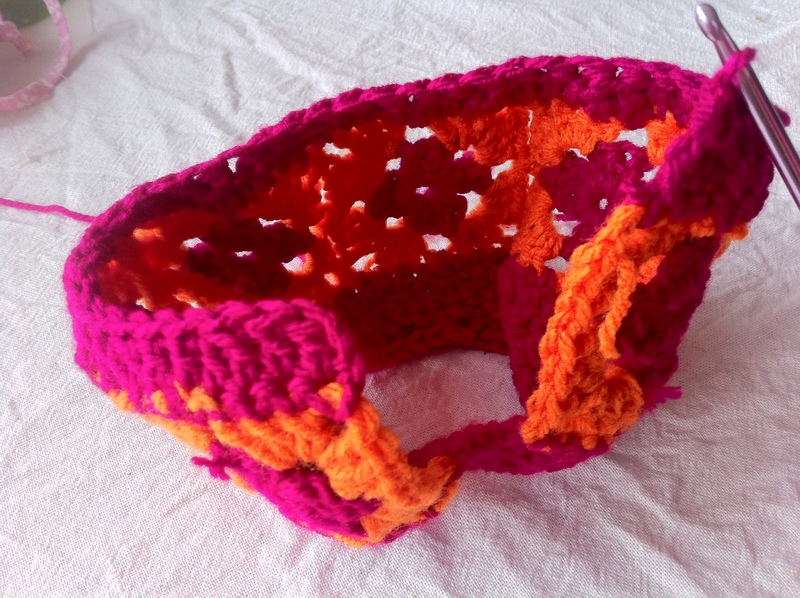 You have permission to sell the finished products from this pattern but re-writing, re-selling, distributing, or copying this pattern itself is prohibited. 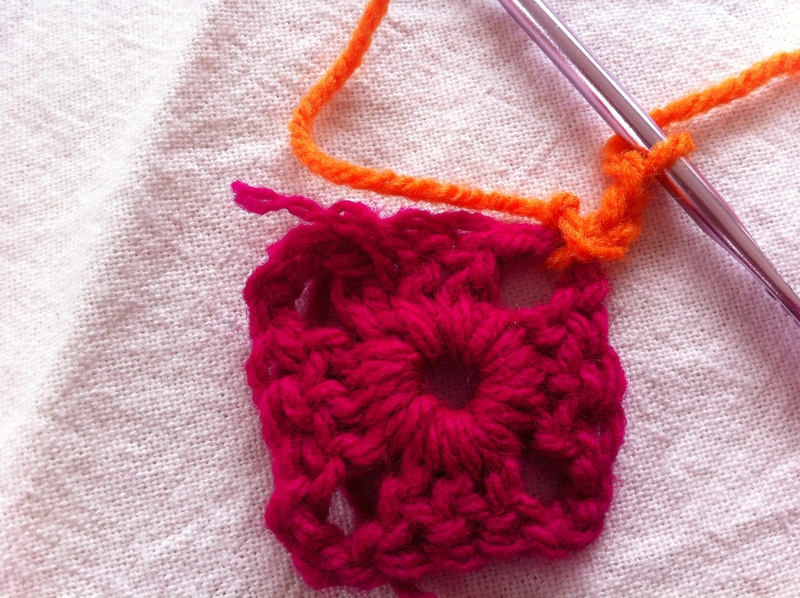 This is my first ever crochet tutorial. I hope you’ll be patient with me and let me know of any errors. 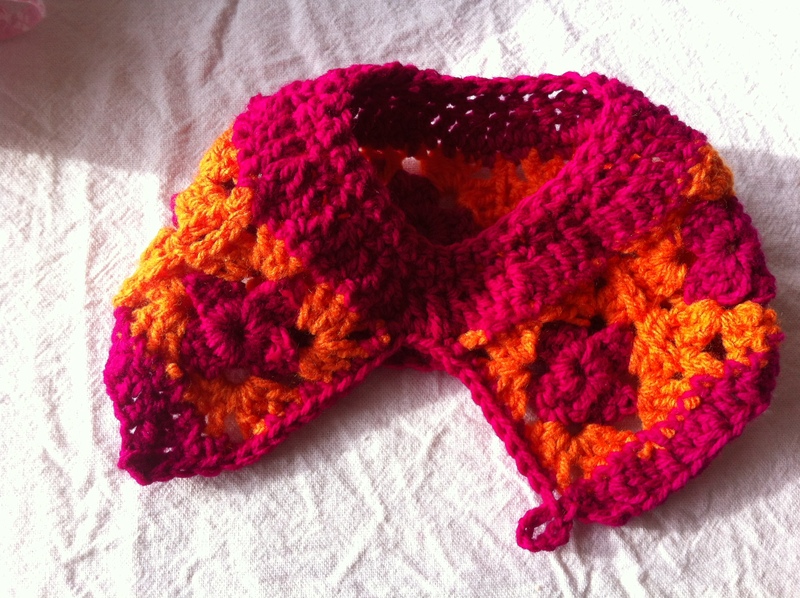 I made these cosies with DK acrylic yarn (mine were Kmart brand) and a 4.5mm hook. 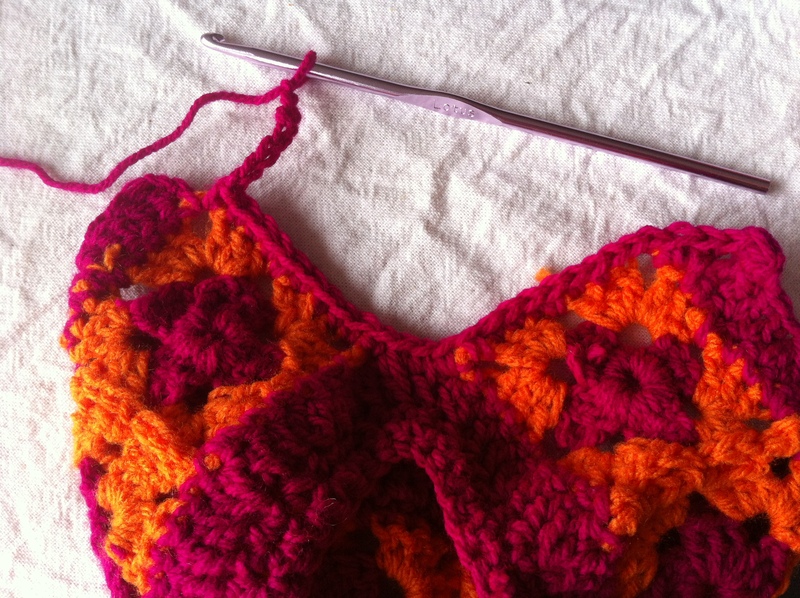 You will also need a button and a needle and thread to sew it on. I had planned to give you a little description of each (you know “yarn over, insert hook, pull through a loop” and all that malarkey), but I think it would be better for both of us if you typed any stitch you’re unsure of into YouTube and watch one of the many excellent stitch tutorials available there. 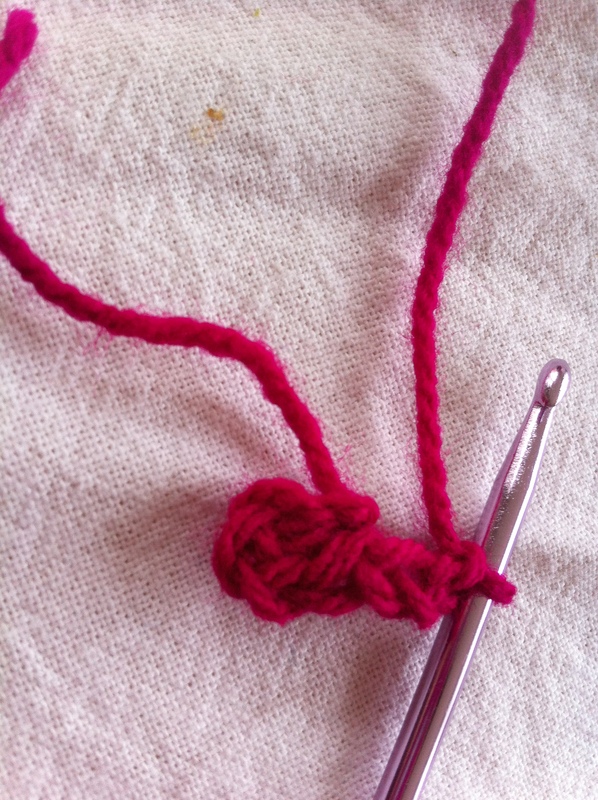 To begin, ch 4 and slip stitch into beginning chain stitch to make a loop. Now *(ch 3 and work 3 tr into loop). Repeat from * two more times. You should have 4 “shells” in your loop. Ch 3 and attach to the top of your first 3 ch with a slst. Fasten off and change colour. Now, attach your new colour with a sl st in one of the corner spaces (doesn’t matter which one) and ch 3. This counts as your first tr. Work 2 more tr into the same corner space, then ch 3 and work 3 tr into the same corner space. Next, * (ch 1 and move on to the next corner space. Work 3 tr, 3 ch, 3 tr into this space) repeat from * 2 more times, then ch 1 and join with a sl st to your original ch 3. Fasten off. 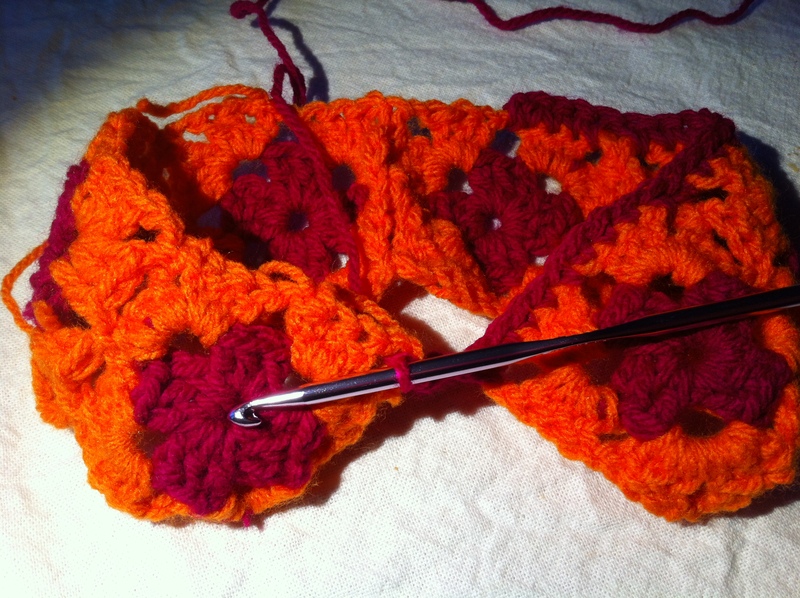 Work the first two corners as before, then work your first 3-treble shell into the third corner. 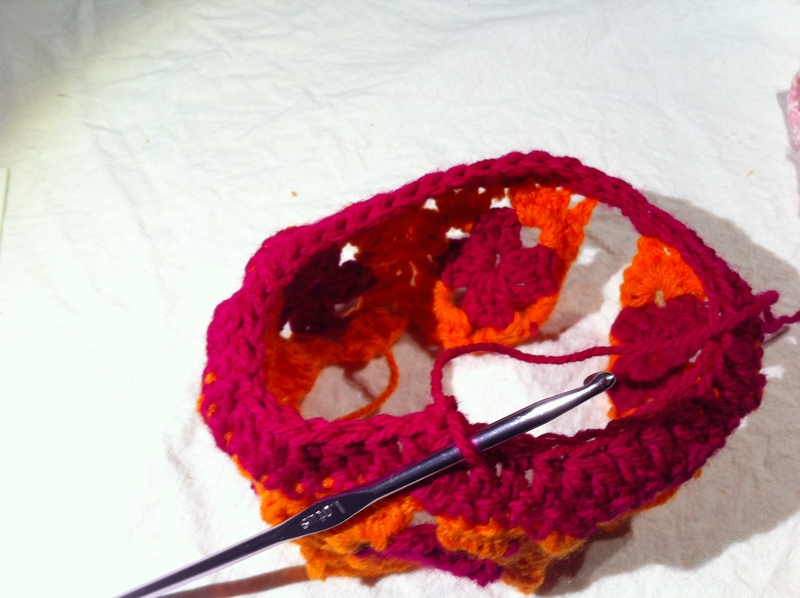 This is the point when you would usually work a 3 ch space, but because this is the side you want to join, work 1 ch and then 2 slip stitches into the corner of the square you’ve already made. Next, work your 3 tr shell as usual. Then, instead of working a ch 1 space, work a sl st into the corresponding side space of the square you want to join. 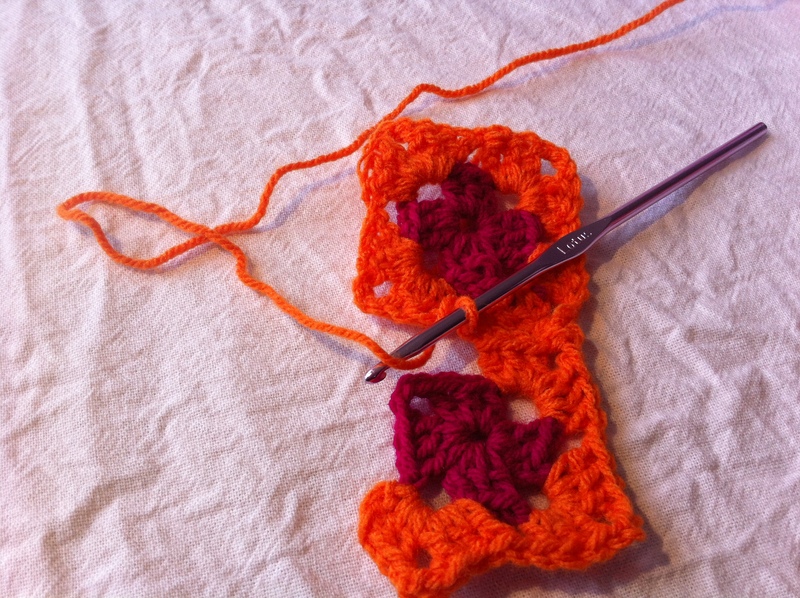 Now work your 3 tr shell into the next corner and, instead of your usual 3 ch space, work 2 slip stitches into the corner space of the square you want to join and 1 ch. 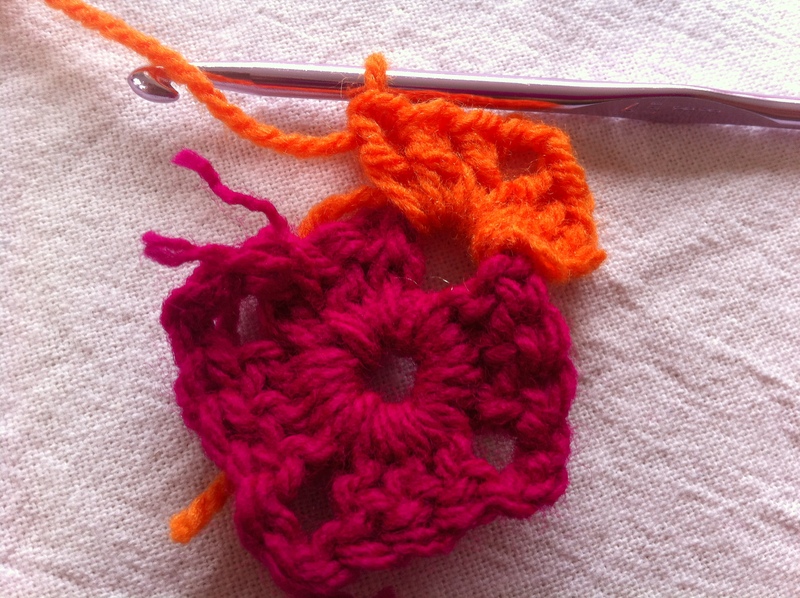 Then work your next 3 tr shell and complete the square as usual. Heave a small, happy sigh and admire your handiwork. 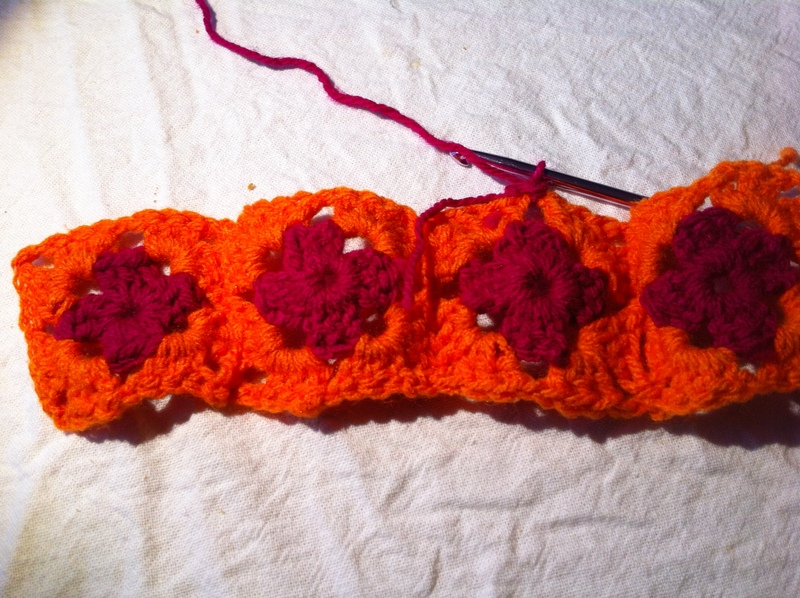 Join your next colour to your granny strip on one of the long edges, but not at the corner. Dc in each stitch/space to the end. 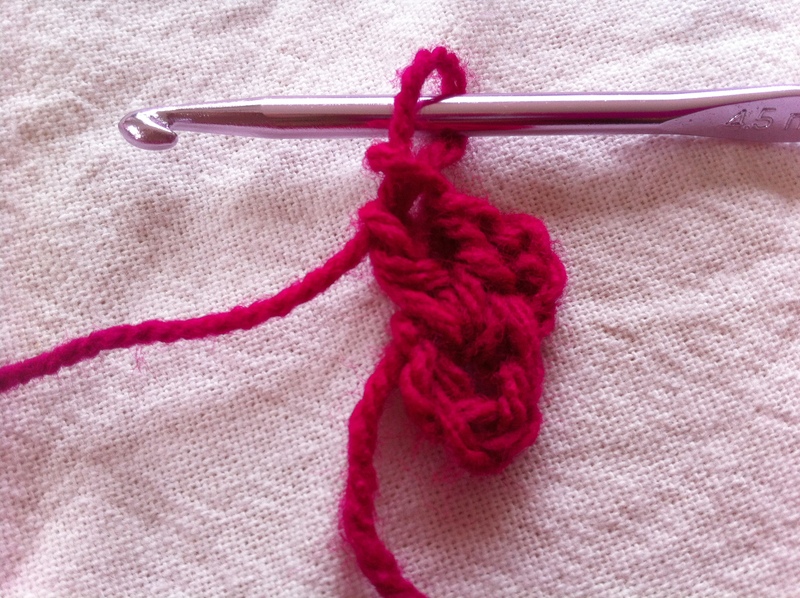 And bring the other end of your granny strip around and make a slip stitch into the first corner. 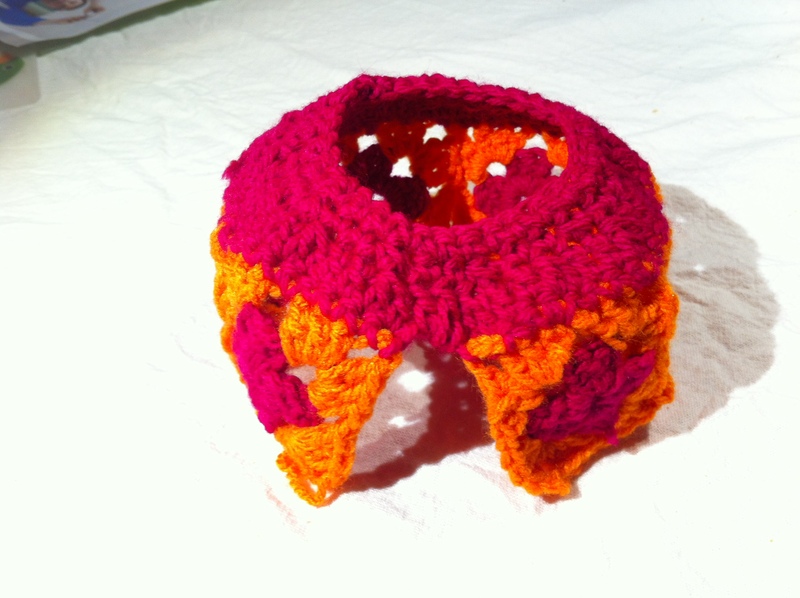 You’re making a little belt for your teapot. Now continue to dc around until you get back to the start. Join with a sl st to your original ch 1. Now for a round of decreasing trebles. Ch 2, *(2 tr, tr2tog) around, then join with sl st to ch 2. And now some decreasing doubles. Ch 1, then (2 dc, dc2tog) around. Join with a sl st. 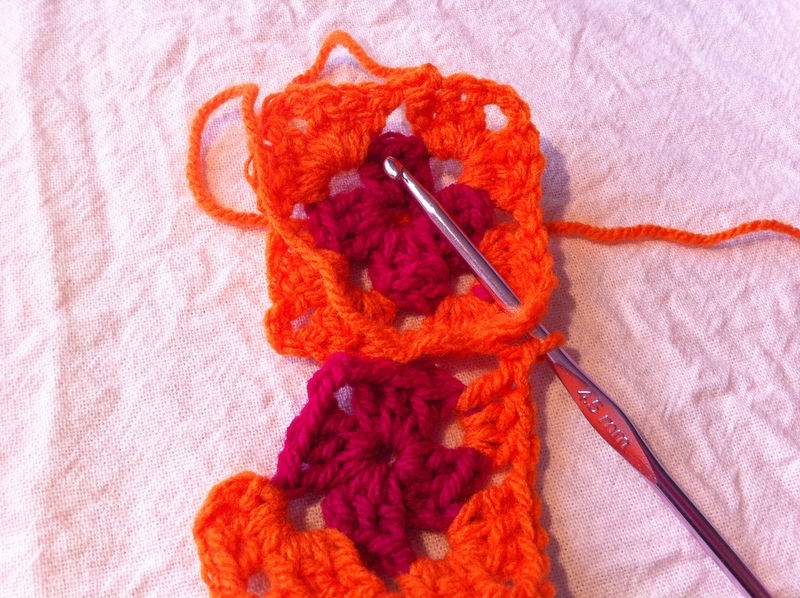 Finish off with a round of double crochet. Ch 1, then dc around. Join with a sl st and fasten off. Now flip your work upside down. We are going to work into the other long side of your granny strip (as an aside, anyone who reached this page by googling “granny strip” needs to sit down and reflect on the direction their life is taking). 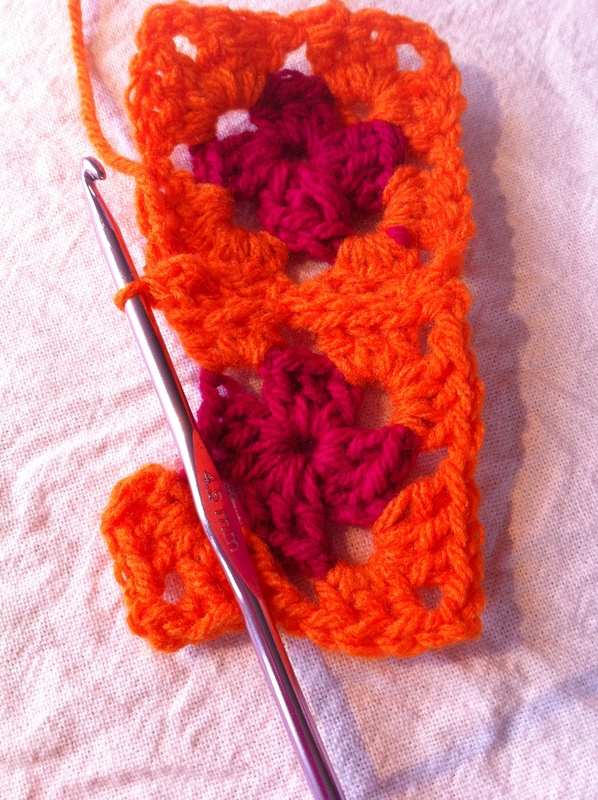 Attach your yarn with a slip stitch into one of the end corners. 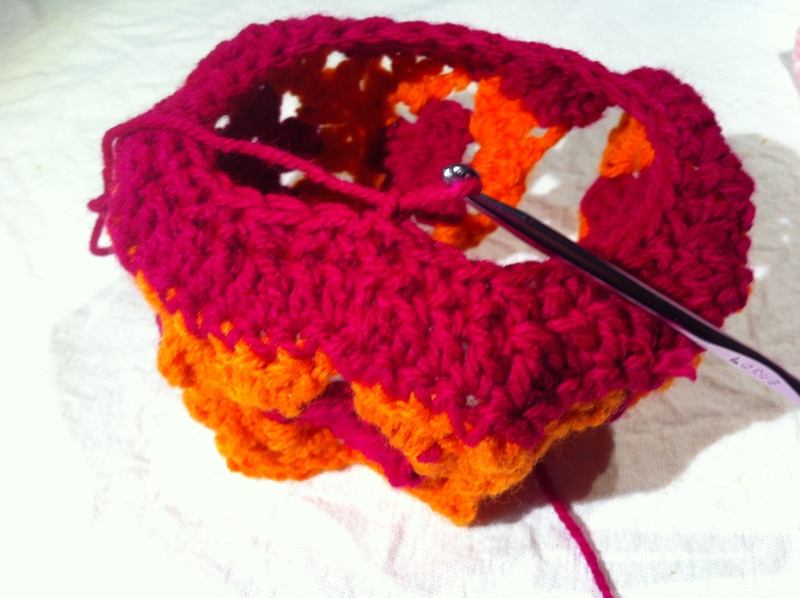 You will be working in rows from corner to corner in a similar way to the rounds you just did. Now do a row of dc. 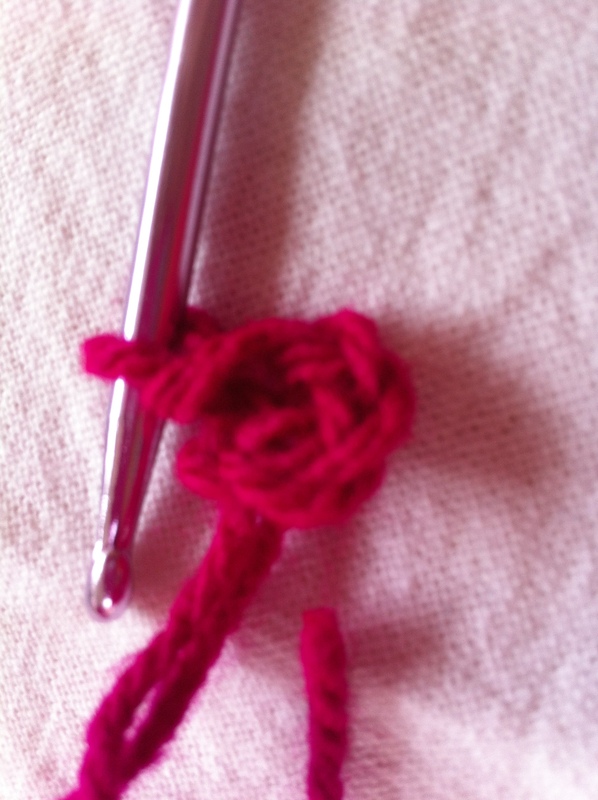 When you get to the end, work 3 dc into the corner stitch. Do not turn. 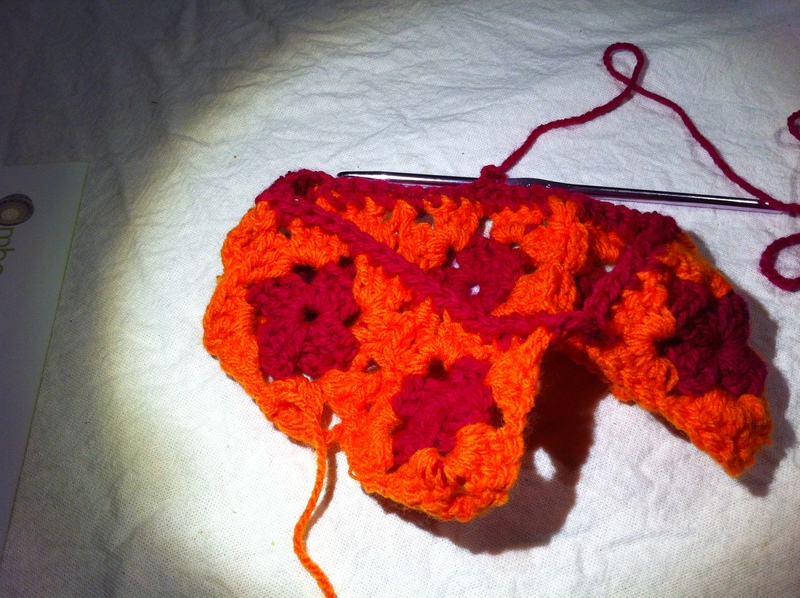 Continue working dcs up the side of your granny strip, around, and down the other side. 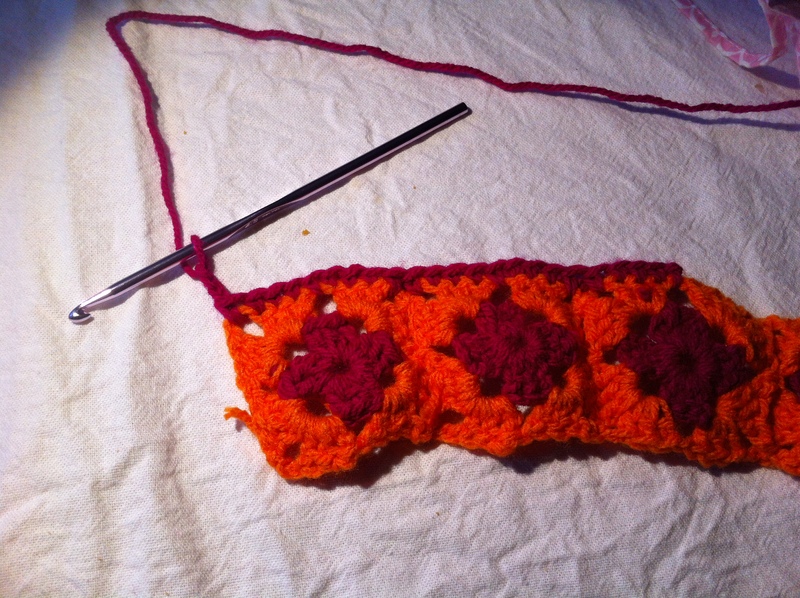 When you get to the end of the second granny square edge (about 2 cms from the end of the row), you’ll be at around the right place to work a button-hole loop. 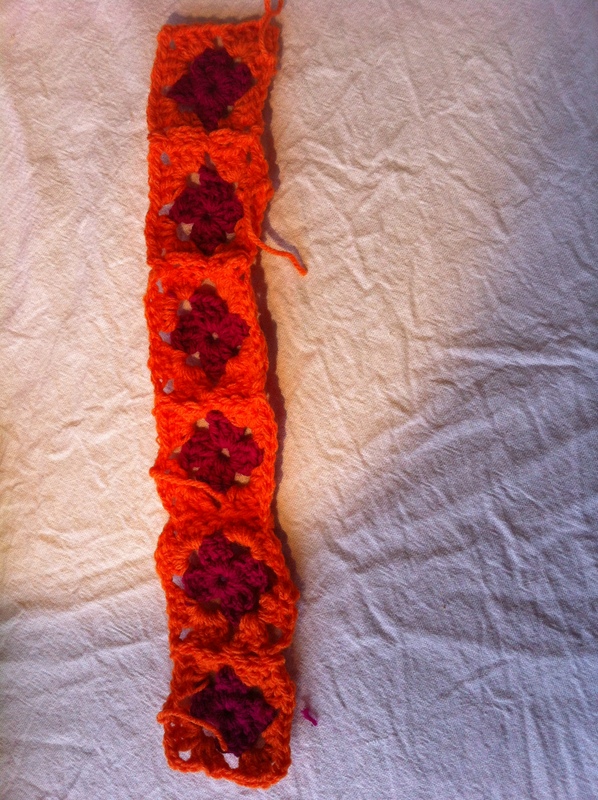 The size of this will depend on the size of your button, but I will say ch 8 and join with a sl st to the same stitch. Then continue on your way, working dcs until you reach the other corner. Join with a sl st and fasten off. Dance a quiet jig (just a wiggle in your chair will suffice). 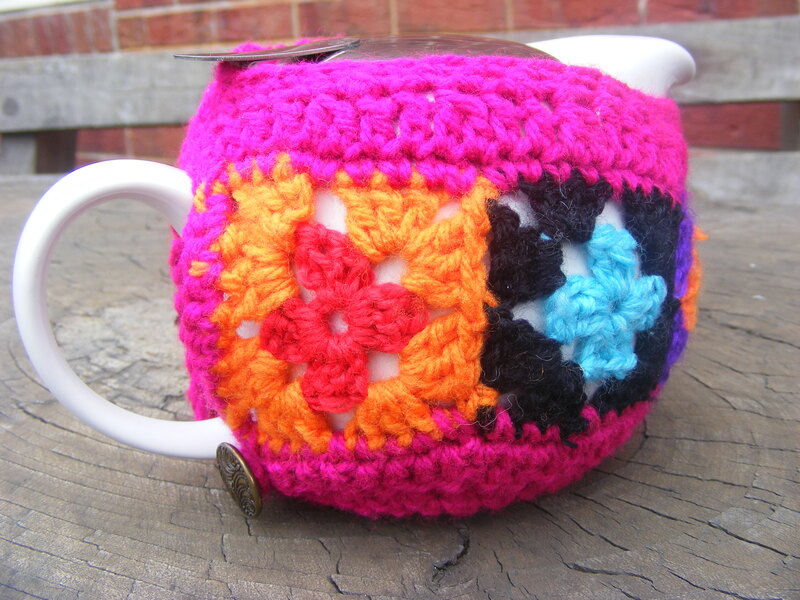 Next comes the exhilarating task of choosing a button and the less-than-exhilarating task of sewing it on (you want the cosy to button up snugly under the teapot handle). And you’re all done! 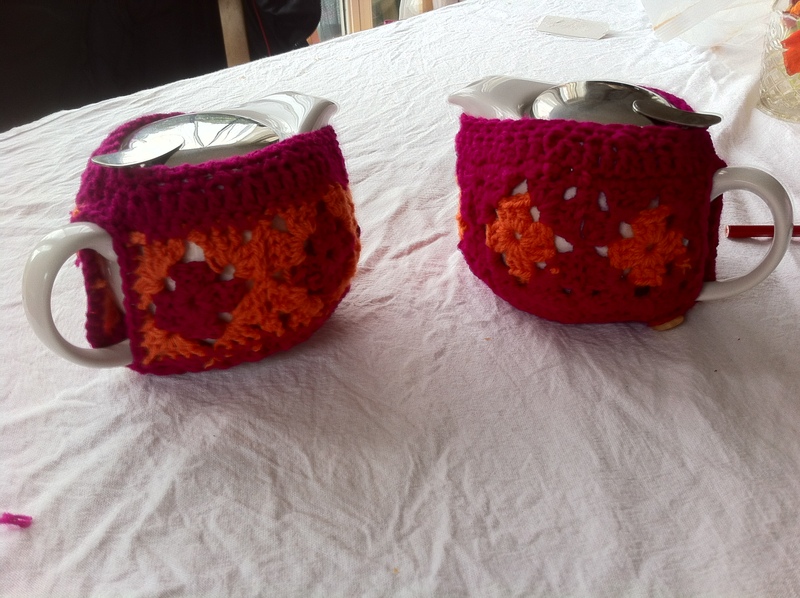 Just what you need to bring a snug, homespun touch to your (or your lucky friend’s) kitchen! Like this pattern? Think it needs some adjusting? 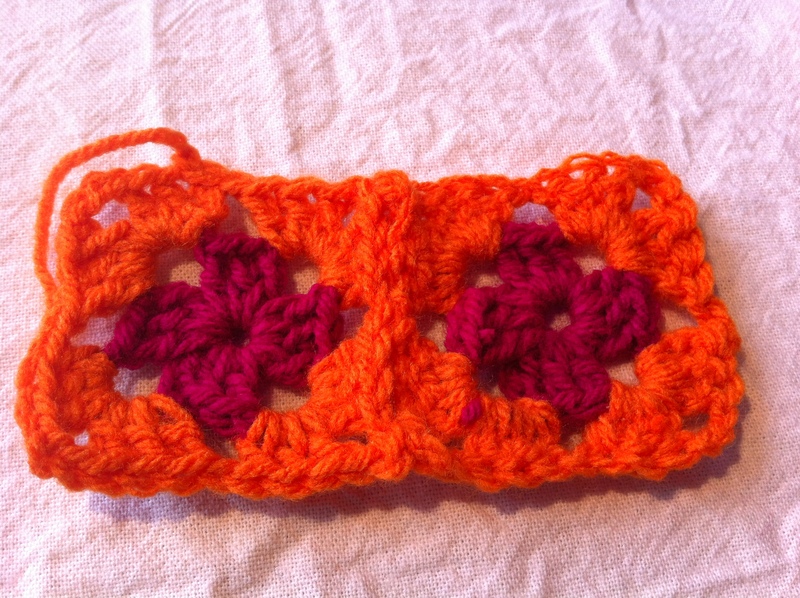 Please leave me a comment and share this pattern with your friends – they might end up making one for you! 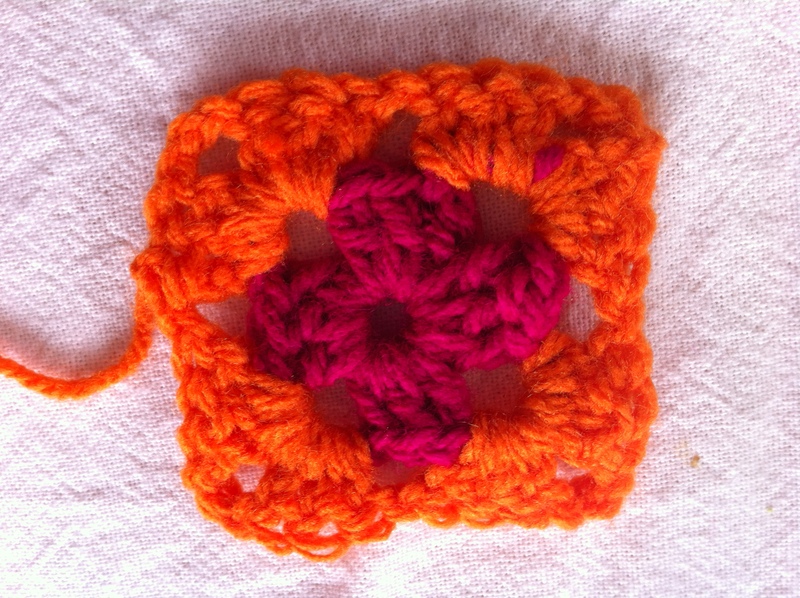 Thanks for the tutorial and I especially want to thank you for showing me how to join the squares while working to make the squares. 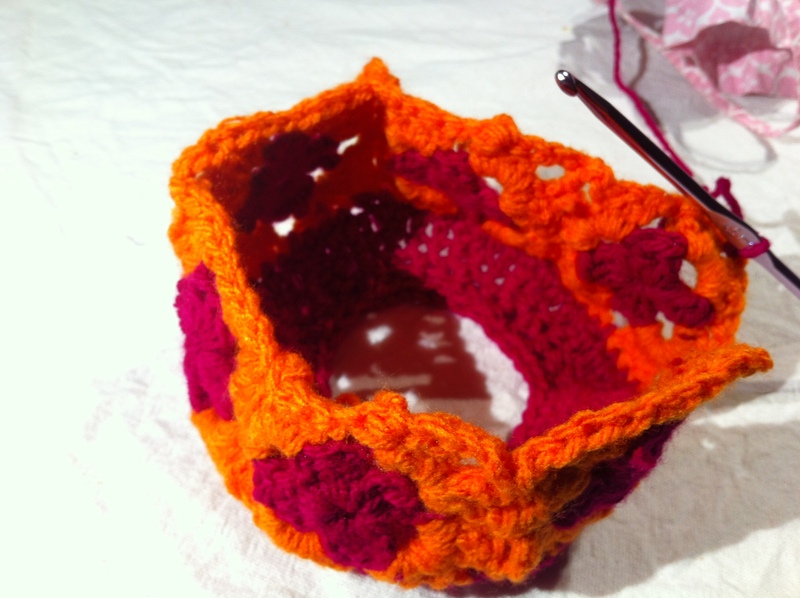 I also hate after completing the squares to have to join them and this is terrific….I can use this on lots of my projects I have begun using Granny squares…you rock!!! Thanks, Sandy! 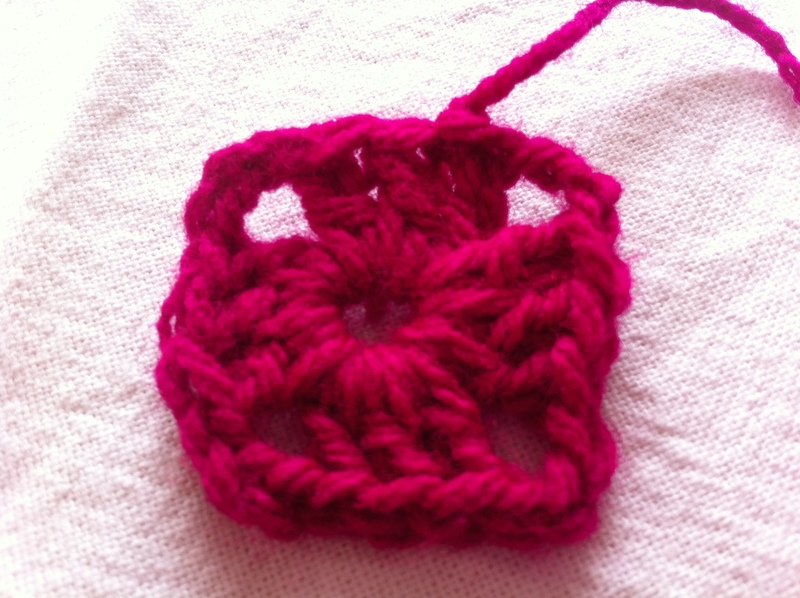 I love that method of joining squares too, though I can’t take full credit – I got the idea from another blog! I posted your parcel earlier this week. I got a little kerfuffled at the post office (I packed the parcel there as you have to pay at the counter). I had meant to slip a note in (plus a few extra goodies), but when I asked the lady at the counter to weigh it, she sealed the bag and I forgot all about the note! I hope it reaches you in good time.